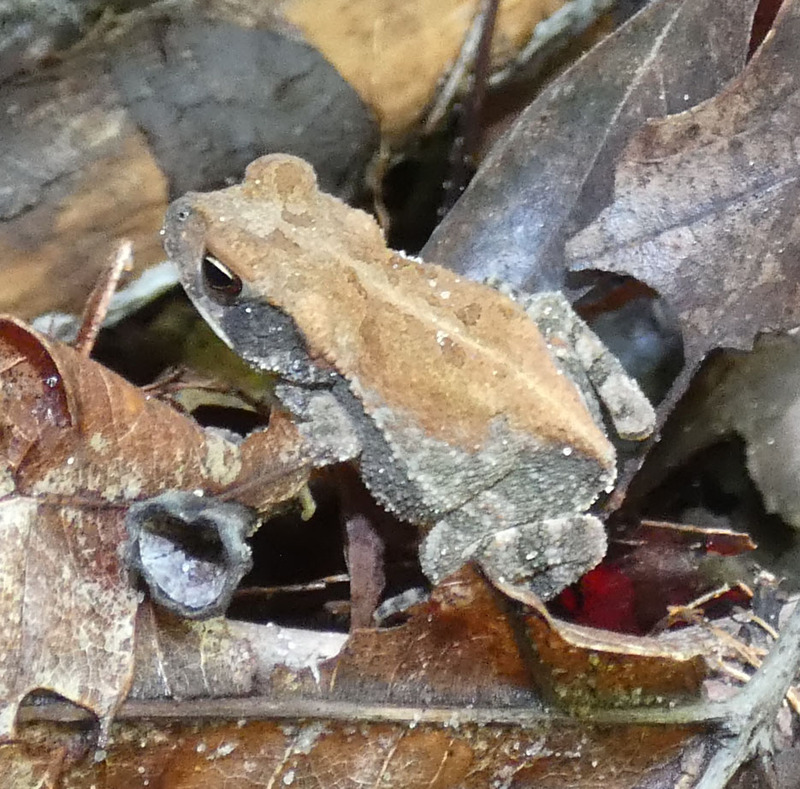 A few weeks ago, when we went on the walk at the Center for Biological Research Studies, I saw an unfamiliar amphibian. 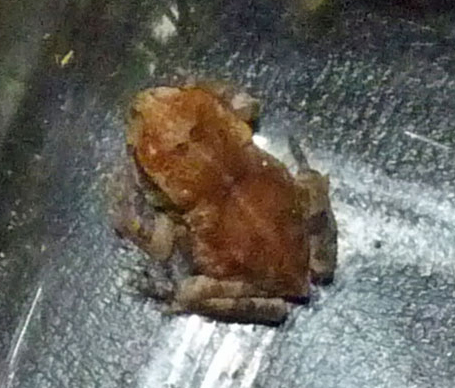 Looking at the small picture on my camera screen, the director identified it for me as a Gulf Coast toadlet, but later, when he saw the actual photo, he said that instead it was a Woodhouse’s Toad toadlet. I checked in my file of unidentified species from our farm, and found photos of the same type of toad, from July of 2014. 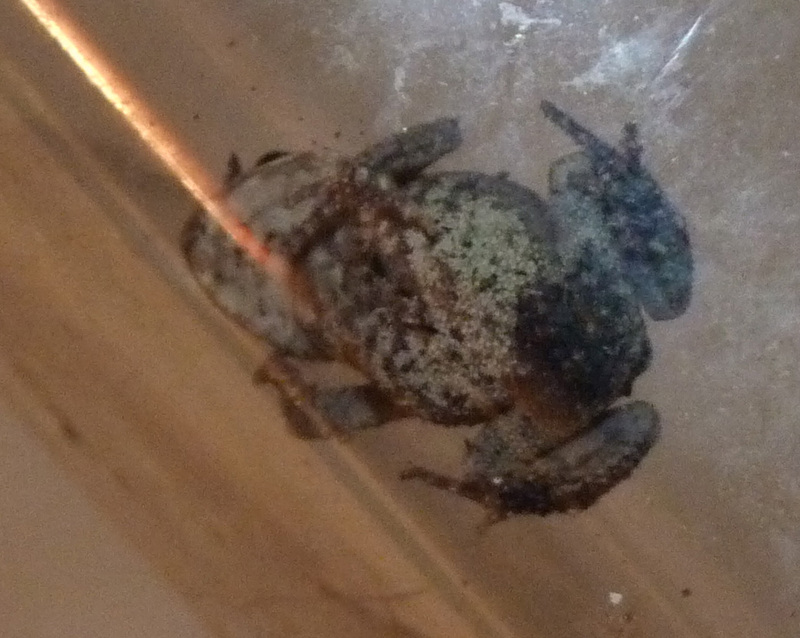 Mystery amphibian now ID’d as Woodhouse’s Toad, Bufo woodhousei. One thing I have learned when I take pictures, is to try to capture as many angles as possible. Sometimes you need to know details like the shape of the ear or the stripes on the leg, to figure out what species you are looking at. 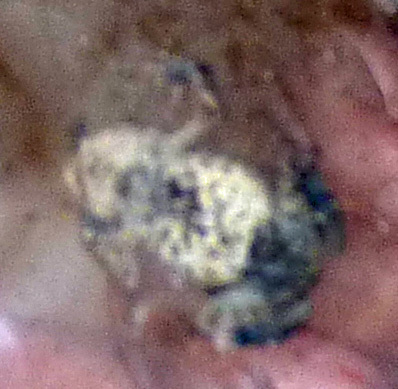 So when I took pictures of this amphibian, I got pictures of the underside as well. 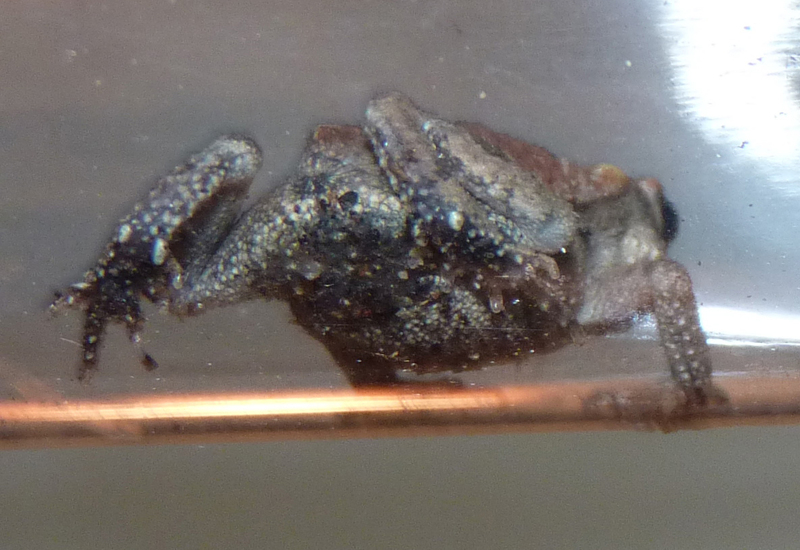 Underside with flash — blurry, but it gives more detail of coloring. According to the Audubon Field Guide to Reptiles and Amphibians, Woodhouse’s Toad has four subspecies — Woodhouse’s, Southwestern, East Texas, and Fowler’s (and the director told me that there has been a lot of discussion as to whether these are one species or multiple). I still would never have identified this toad from the guidebook, because they only show one photo, of an adult, and it doesn’t look like the ones I saw. But once I had the species name, and looked at the description, I read that the East Texas subspecies has a dark back and a spotted chest. And the sound file at Texas Parks and Wildlife Department, matches what we hear. And apparently, both times I was very lucky to see it, in the day time at least, because they are primarily nocturnal, and usually hide during the day. So I am very glad to have an identification for this species at last. Also, back in May, my daughter and her family were visiting, and we took my grandson down to the creek to play. Just as we were about to sit down, my daughter noticed a frog I had never seen here before. 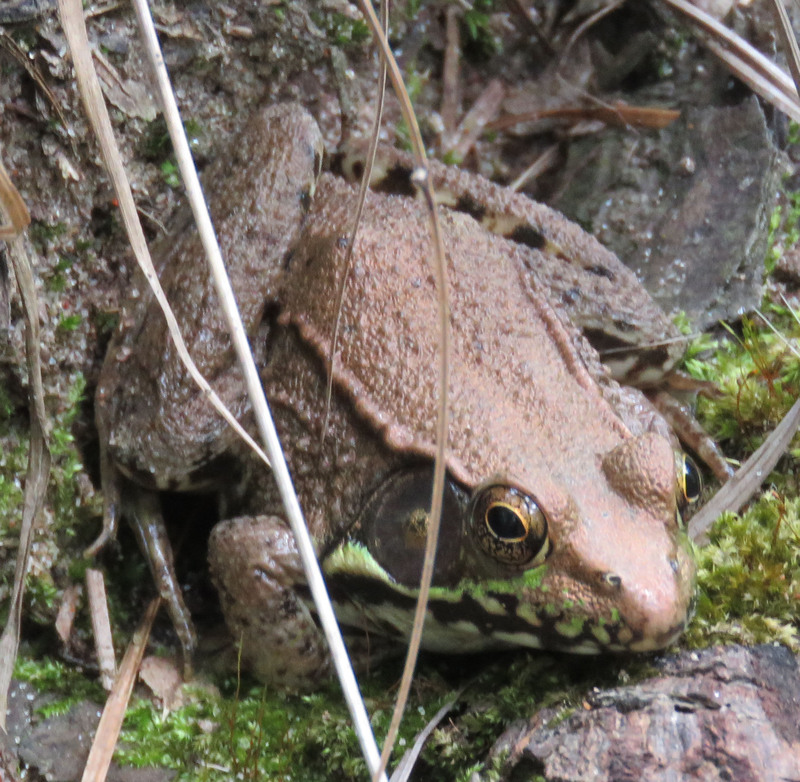 Fortunately, this one was easy to identify — it is a Green Frog, subspecies Bronze Frog. I really love that line of bright green color under its eye and tympanum. I will add them to my ongoing list of the species we have documented on the farm — that will bring our list of amphibians up to ten! Nice work, it’s always satisfying to ‘nail’ an id. I do like tucking in a loose end, especially one I would have never figured out. I don’t know how people do figure out what color and appearance changes individual animals go through, much less which ones belong together in a species. So glad there are smart people out there! What you mention about photographing from all angles has been one of the hardest things for me to learn with flowers. So often it’s the shape of a leaf or their arrangement on the stem that tells the tale. There are instances when I just give up, because the differences are so slight or so hard to determine without microscopes that — well, I confess I don’t care. For my purposes, genus and species is good enough, without trying to pin down the variations. I am envious of your toads. I rarely see a toad or frog, although I often scare them up and know they’re around because of their “ker-plunks”! I am looking at the snake that’s up there with the title “New Snake ID.” It tooks to me like a plain-bellied water snake. I’m going to go have a look.